If you are looking to find an easier way to list your ads on higher position in Adwords then these 5 tips can come to your rescue. I have implemented these tricks and found some great results both in terms of traffic and conversions. Hope, you can also benefit from these ad optimization tips. But, before I discuss those tips, let's learn a bit on the metric Ad Rank. It is the single metric that affects the position of your ads on Google search results. Ads having a higher ad rank are displayed at the top positions (above the fold) while ads having a low ad rank are displayed on the right hand side, on the 2nd page or below the organic search results. Hence, your ad rank is the factor which decides the position where your ad would get displayed. Bid amount is the your max.CPC bid that you are willing to pay to Google for every click on your ad. Remember, max.CPC is not equal to your actual CPC. 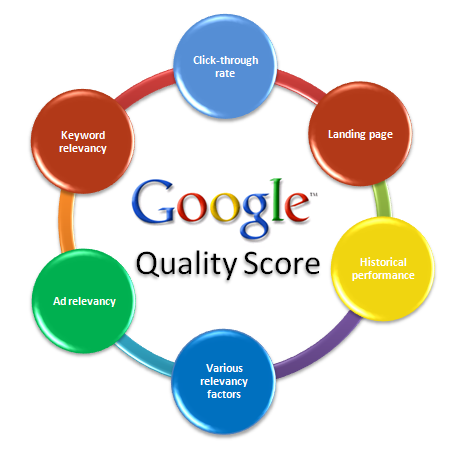 Quality score is an individual score between 1-10 that Google provides for every keyword. The higher the quality score, the better are the chances of your ad rank. Please note: Google uses exact match keyword performance data when calculating CTR performance. App Extensions - to initiate app downloading right from your ads. Call Extensions - allows customers to call you just by clicking your ad. Consumer Rating Annotations - allows you to display seller ratings and other high quality survey data. Location Extensions - helps to locate your nearest store using Google maps. Review Extensions - allows you to display third party reviews from reputable sources. Previous Visit Annotations - allows customers to see when and how many times have they visited your site before. Seller Rating Annotations - allows you to display your online business ratings. Sitelink Extensions - Choose and display sitelinks that are most likely to generate sales. Callout Extensions - display descriptive texts and offers to initiate clicks and conversions. Dynamic Sitelink Extensions - allows you to display dynamically generated sitelinks based on search query and inner page relevancy. Social Annotations - display your Google Plus followers. Create and let Google choose these extensions based on the search query and location relevancy. Adding these site extensions will help to increase the overall Ad rank, thereby improving your ad position. Although, the default option in adwords is "optimize for clicks" but in case it's unchecked, I strongly recommend to use this option while promoting your PPC ads. Optimize for clicks will give preference to those ads that are expected to give more clicks thereby increasing your CTR and Ad rank. If you are running campaigns that are based on conversions only then please ignore this option. 400,000 unique feed items per account. A feed item is a unique piece of data for an extension, such as a sitelink, phone number, review, or location. Remember to use exact match keywords in your ad title and CTA text in your description. Your ads must comprise of both the elements, keywords and CTA text. 4- Check the Est. First Page Bid and Choose Your Bids Accordingly - Money Matters! This one is really simple. Pay more and get top positions. For this, you need to check out the first page bid suggestions that Google provides you in the dashboard and start bidding in that range in order to get those top display positions. You can find the first page bid suggestions in the keywords column in your ad group. 5- Optimize Your Landing Page, Yes..it Works! adding proper CTA elements in order to generate conversions. Hope that provides extensive information to keep you busy in optimizing your ad campaigns.